They could go all the way, or go straight to hell. All Kayana wants is respect. Jilted by her fiancée, turned out by her family, and rejected by her crew – esteem is in short supply. When she hears about the cash prize for winning the Great Space Race, she realizes it’s more than enough money to get her old life back. Or buy herself an asteroid someplace where she won’t care what people think. Ax Turner just needs to hide, and the Race gives him the best opportunity to do so. In plain sight. Surely the thugs and criminals he’s ripped off won’t come after him while cameras are rolling on the galaxy’s most popular reality game show. And if they do, well, having a partner who’s able to fight and looks like a devil seems like a win. They’re on the run – from the past, from the lethal challenges of the Great Race, from their feelings, and straight into each other. 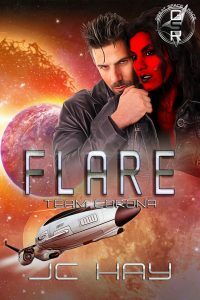 They’ve got more than their share of problems, and those secrets could drive them apart, or be the key to winning the biggest prize of all: each other. This novel is part of the Great Space Race multi-author series.